For the past few years I’ve had seasons tickets to the Kennedy Center’s modern dance season, but this year I opted for the ballet season instead. Largely inspired by my own forays into the genre, I wanted more exposure to the discipline, athleticism and rigorous aesthetics of classical dance. And, I’m not going to lie, I wanted to rediscover the old familiar stories that are the core of classical repertoire. You know, familiar stories like The Sleeping Beauty, where the beautiful princess Aurora pricks her finger on a rose is thrown into an enchanted sleep, and then the dashing hero is bitten by a vampire fairy so that he’s still around 100 years later to wake her up and rescue her from being sacrificed in a throbbing, red-lit night club. What, did you forget that there are vampires in Sleeping Beauty? Please. If you’ve been paying attention to pop culture at all over the past five years, then you know that there’s no story that can’t be improved with a little vampirism. But let’s back up a minute. 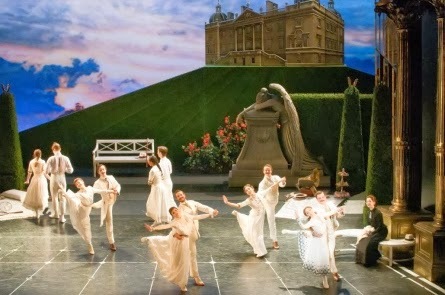 Matthew Bourne is one of Britain’s leading choreographers, famous for creating fantastical new ballets (such as Edward Scissorhands) and reimagining the classics (a Nutcracker set in an orphanage; an all-male Swan Lake). 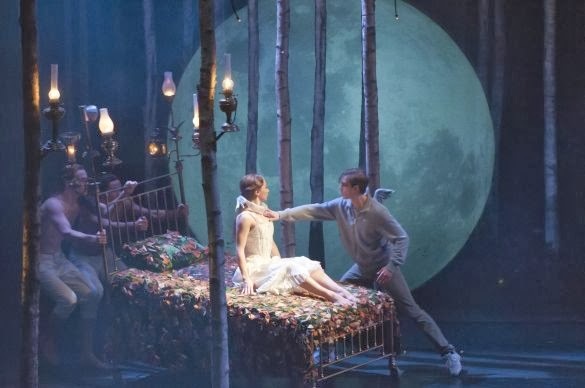 His latest tribute to Tchaikovsky is Sleeping Beauty: A Gothic Romance, which is playing at the Kennedy Center this week. It’s a relatively new piece (just a couple years old), and it’s been touring the United States and receiving great reviews. I saw last night’s performance at the Kennedy Center and really loved it. The first act is much as you’d imagine it to be. 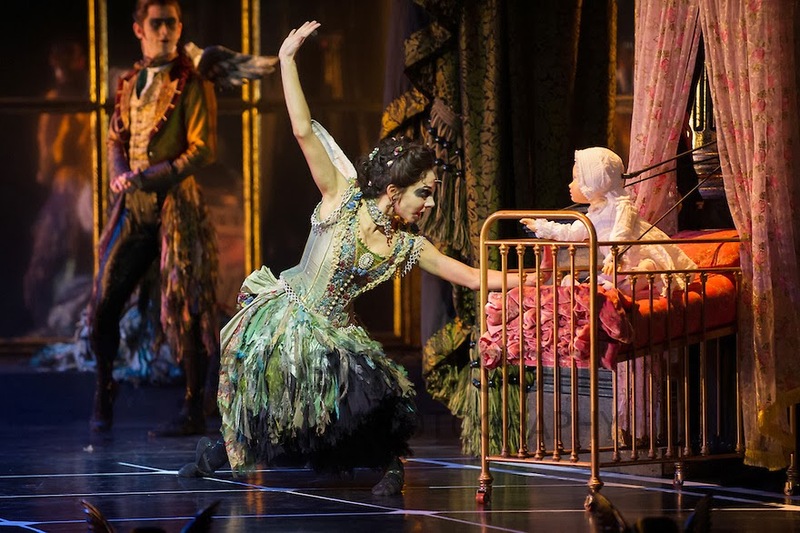 Set in 1890, the year Tchaikovsky premiered the original ballet, we meet the infant princess (a precocious and highly mobile puppet) in a stately, late 19th Century palace and witness the bestowal of gifts by all the good fairies. Only in addition to the traditional gifts of beauty and grace, the fairies seem to bless her with mischief and a sense of humor as well. She may only be a baby, but she’s got more personality (and is way less passive) than your typical gothic heroine. 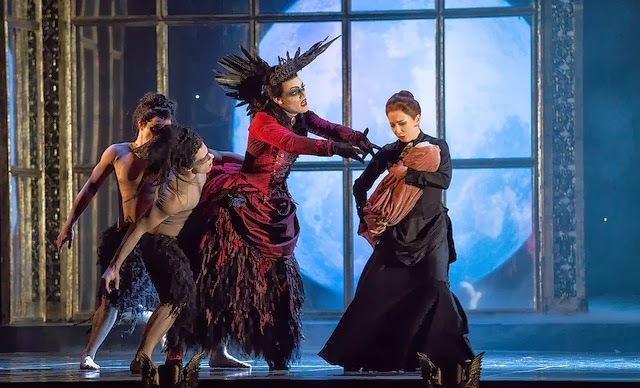 Then, inevitably, the evil fairy, Carabosse, arrives to place her curse on the baby in retribution for the parents’ failure to thank her for helping them conceive in the first place. What I loved about this scene was the depiction of Carabosse’s dark prophecy. The baby was spirited away and, in its place, appeared the adult woman dancer — only she was faceless: a flesh-colored mask eliminated all features, to very creepy effect. Fast forward twenty-one years to 1911, when the world looked like a Seurat painting and people played lawn tennis in white linen suits. Doctor saves Sleeping Beauty from the Weeping Angel. Our princess is now all grown up and as mischievous as ever. Bored by her aristocratic suitors, she runs off into the bushes with the game-keeper who is super cute and well supplied with roses. One thing leads to another and, next thing you know, Aurora has pricked her finger on the fatal black rose and landed herself in a coma, leaving her parents, suitors and game-keeper in a state of woe. Which is understandable given that they’ll all be dead by the time she wakes up one hundred years hence. Which brings us to an interesting narrative point. In the original story (Charles Perrault’s La Belle au bois dormant), the prince doesn’t show up until the end of the hundred-year sleep. So it’s the classic love at first site thing that so often shows up in fairy tales, but which makes little sense and holds very little dramatic interest (at least, until we learn that his mother is an ogre who wants to eat the grandbabies, but most people leave that part out). Disney recognized this narrative flaw and solved it by introducing the prince pre-pricking and then cutting out the hundred-years’ sleep. Matthew Bourne also introduces the prince figure (in the character of the game-keeper) early on, but he doesn’t shorten the sleep. Instead, he reveals that the fairies (even the good ones) are all actually vampires, and has the main fairy turn the game keeper into a vampire, too, so that he’ll be around in 2011 when she’s finally ready to be woken. But here’s another wrinkle. In the Tchaikovsky version, once Aurora wakes up, it’s all happy bliss for the next however long before the ballet finally ends. They get married and live happily ever after and it’s all excessively boring. Pretty, but boring. So Bourne has Carabosse’s evil son, Caradoc, abduct Aurora right after the gamekeeper wakes her up and take her to his evil lair (a bumping night club), where he plans to strip off his shirt and show off his tats and wings. Oh, and stab Aurora in the heart, too. 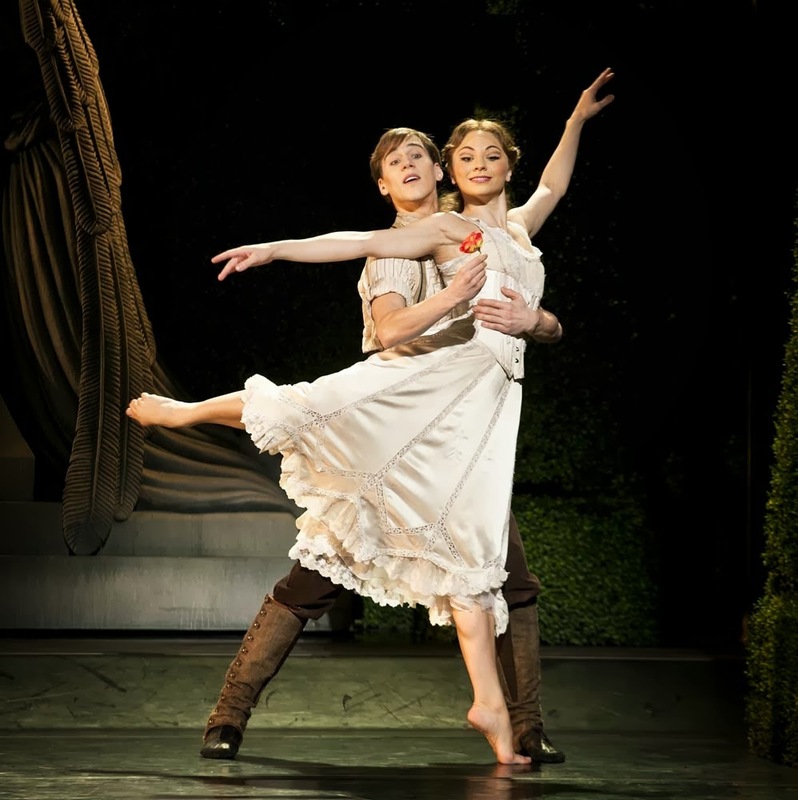 This was my first time seeing a Matthew Bourne ballet live, and I thoroughly enjoyed it. I liked the imagination and playfulness, and how he was willing to turn a potentially stuffy old tale on its head. I also really liked how he played with the time periods. Francophile that I am, I like it when storytellers leave Perrault’s vast timeline intact, and I love it when they have the integrity in set design and costumes to accurately reflect the passage of time. So to go convincingly from the 1890s to the Edwardian Era to contemporary times was a fun little exercise in time travel. That said, I realized early on that Bourne’s priority is telling an engaging and easily accessible story, not on presenting rigorously pure ballet. The footwork did not seem particularly complex, and there was nary a pointe-shoe in sight. I missed that. But as a work of dance theatre, the piece was lovely and playful and lots of fun. I am more jealous of missing this performance than I am of most of the ones you review; and a big part of that is because of the glimpses of the forest set in the trailer. Tall stark tree trunks with lanterns! Oh, my director's heart flutters at the sight.